Save $200! Use promo code: SPRING200 at the checkout. The ZOLL AED Plus Fully Automatic has a wide range of unique features to help you through every step of the rescue process from effective CPR delivery to heart analyzation. Just dial 888 820 0760 and we’ll be more than happy to share our unrivalled defibrillator knowledge with you. *The ZOLL AED Plus comes with a 5-year warranty. When registered, the warranty is extended by 2 years. The ZOLL AED Plus Fully Automatic comes fully equipped with effective CPR coaching, allowing for the most effective chest compressions possible. As a fully automatic device, your AED will automatically deliver a shock if required to the patient, advising you before defibrillation is charged. This takes the decision out of the responder’s hands, allowing them to fully concentrate on other aspects of the rescue process such as effective CPR. Proven to improve the delivery of CPR by 277%, Real CPR Help technology will monitor the rate and depth of chest compressions delivered, ensuring you’re providing the most effective CPR possible. You’ll receive positive feedback for “good compressions” and will be advised to “push harder” if needed. 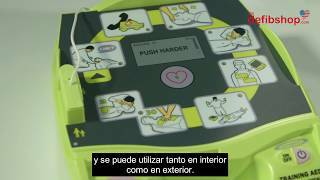 This manufacturer offers a 'heroes for life' program, whereby sudden cardiac arrest survivors are given the opportunity to donate an AED Plus device to a charity of their choice. With this scheme, ZOLL aims to get more accessible AEDs in the public domain, potentially saving more lives. Want to learn more about the range of ZOLL AEDs? Our helpful defibshop team are here to help. Simply call 888 820 0760 where you’ll be connected with one of our advisors who will answer any queries you may have. An IP (Ingress Protection) rating classifies the degrees of protection of an electrical item against water and dust. Beginning with IP and followed by two numbers, the first digit is indicative of the item’s resistance to dust and the second is of its resistance to water. Protection against dust is measured from */ 0 up to 6, whereas protection against water is measured from */ 0 up to 8. The protection against these elements increases as the number does, with * / 0 telling us that the item has NO protection against either dust or water. The IP rating of a defib will tell you (and us!) whether it is suitable for the environment where it’s most likely to be used; for example, if there is a good chance your defib may be used in an outdoor environment, you will need a unit with a higher IP rating to ensure it can be used regardless the weather or terrain. If you are looking for a defibrillator more suitable for an indoors environment, you can afford to choose one with a lower IP rating, based on the other features that may be more suitable. When a particular product is “approved” by the FDA, this marks the pass in the premarket approval (or PMA) application of a particular product which has been submitted to the FDA. To receive approval of a device through a PMA application, the applicant in question must provide reasonable assurance of the device’s safety and effectiveness which is then challenged by the FDA before being approved. Whilst all AEDs can be used to increase chances of survival and even save a life in the event of a cardiac arrest, FDA approved devices provide that extra piece of mind that the specific unit being used has undergone vigorous and substantial testing to ensure that that particular piece of equipment operates just as it should and provides the most effective care possible. Many manufacturers perform their own tests on products, but not all defibrillators will undergo the same premarket approval as FDA approved devices and there is no guarantee or stamp of certification if testing has taken place with non-FDA approved products.